Long before it became the hype-machine it is today; technologists predicted the widespread adoption of virtual reality. The idea and concept were always there, but the technology still hadn’t caught up. Fortunately, those days are long behind us, and consumer VR technology is positively thriving now. That’s certainly a good thing because virtual reality is a ground-breaking technology that lets people have genuinely out-of-body experiences. So now that we have access to affordable VR headsets such as the Oculus Rift, how will our lives change? Will they become an integral part of daily routine like smartphones? Or will they be things which lose their novelty within a few days? The good news is that virtual reality has a plethora of uses. From training pilots to treating PTSD, virtual reality can find use in nearly every walk of life. The applications of virtual reality are nearly limitless. But how will virtual reality improve the life of the average consumer? If you’ve bought a virtual reality headset, what sort of interesting uses can you look forward to? With affordable VR products such as Google Cardboard further increasing the adoption rate of virtual reality, it’s only a matter of time until you own one. Let’s take a look at the ways VR headsets can improve your life. Dreams have captured the imagination of people since the existence of humanity. They can often feature out-of-this-world experiences which would never happen in real life. The fascination with dreams can be very real but also very frustrating, since you cannot control what happens there. Virtual reality brings with it several elements that deliver experiences similar to dreams. Your eyes can see a fantasy world, you can interact with the world using your hand (sans the feeling of touch), and if soon, you could also smell the world around you. This sort of immersion has never been possible before. But it is now, and don’t have to pay much for it. There are a whole variety of experiences to step into as well. You can experience near-death scenarios, explore beautiful fantasy worlds or even real-world tourist destinations. VR is an excellent way of experiencing the impossible. As VR technology advances and engineers come up with new ideas for engaging our senses, the level of immersion will only get better. Virtual reality is already being used to treat a variety of mental illnesses including anxiety and PTSD. The thing with VR is that the world you’re surrounded in is very real, but obviously very virtual as well. So the usual mental fears stand a better chance of not showing up in VR environments. And as treatment progresses, patients tend to show signs of improvement in the outside world as well, as they start facing their fears and look at ways of dealing with them. 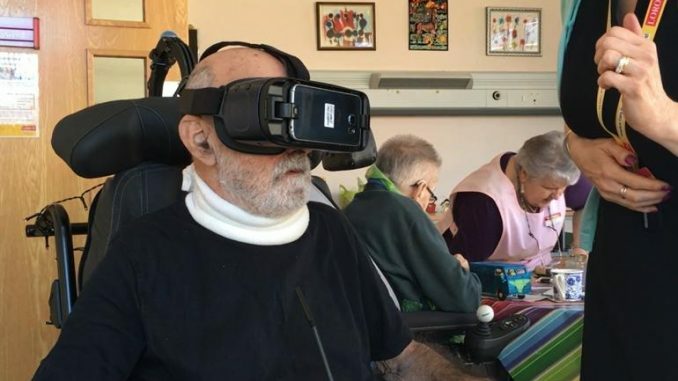 People with difficulties in moving about can finally have the freedom to explore the world if they so want to, with the help of virtual reality. Several apps feature tours of unusual places incomplete VR environments. Even 360-degree videos can provide a sense of being in the scene, which can be very useful for the disabled. In fact, things deemed ‘normal’ such as bike riding, hiking, skydiving, things that are not possible for these people can suddenly be experienced with the help of a virtual reality headset. If you were to choose between learning about a historical moment from a text-book and choosing to relive it through a VR headset, which option would you go with? We’re betting it’d be the latter. That’s because VR presents a better way of learning certain things. And there’s nothing better than seeing the moments for yourself to truly grasp the feeling of what it felt like to be part of that moment. It might not be a 100% percent accurate, but it does communicate it better than writing. And it’s not simple education either. There are now apps that can train surgeons and even pilots. In fact, some flying schools have begun incorporating VR-based pilot training into their programs. At some level, all human beings possess some creativity. All of us have opinions on the way things can look and feel, going along our personal preferences. But designing things can be complicated and for some simply not possible because they think it can’t be done. With virtual reality, the tools to create can be accessed by anyone. A few examples of this would be the painting apps currently available that let users paint using motion controllers. This sort of accessibility means that anyone with even a passing interest in painting will give it a try. And if they find it enjoyable, they’ll continue to do so and might also become professional painters. The possibilities, of course, are endless. For those of us who love to play games, virtual reality brings a whole new level of immersion. Many of us would have dreamed of being in Skyrim, only that now it’s possible. The thing with virtual reality is that it does not have to recreate realistic environments. Fantasy environments are supposed to look different, and that’s what gives VR its level of immersion. Being encapsulated with a view that’s alien can be bewildering and fascinating. And when you walk around in it and interact with people and fight dangerous enemies, the level of immersion goes up even more. Virtual gaming is something that everyone is sure to enjoy. Going to the movie theatre can be an exhilarating experience. But when you have to go their multiple times a month, it can become rather inconvenient and quite expensive. Still, there’s nothing that matches the experience of watching a blockbuster movie on a large cinema screen. With virtual reality, you can recreate that experience within the comfort of your home. Because a VR headset is able to encapsulate your vision totally, you can enjoy a big-screen experience with ease. There are already several apps that let you watch any movie in a virtual reality theatre. Virtual reality is undoubtedly shaping out to be a revolutionary technology. The ability to be transported into an alternate world which can be crafted by human beings and controlled by you is an exciting prospect after all. The applications for virtual reality are wide-ranging and nearly limitless. Developers are coming up with new ideas every day of how this ground-breaking technology can add value to entertainment, and indeed, to our lives as a whole. Virtual Reality headsets can change your life, undoubtedly, but the technology is still new. Find out more about The Best Virtual Reality Headsets.